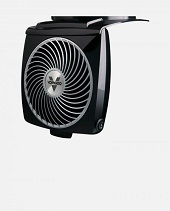 There’s nothing quite like a Vornado fan. 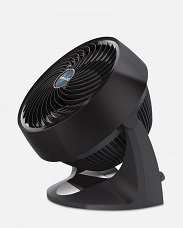 From the unique air circulation to the incredible build quality and HUGE warranty lengths, Vornado fans are like the Lamborghini’s of the fan world. In this guide, I’m giving you an overview of all things Vornado. Every type of fan has been covered – curated into easy-to-read sections and tables. It’s simple to compare between all the different models, so you can find the one that suits you best. If you’re going to be paying for a quality product, you want to make sure you’re paying for the right quality product. Note: We are not sponsored by Vornado in any way. Looking for a quick recommendation? The images below cover the different types of Vornado fans. Click one! You know those companies that started out great, but went downhill after selling out to the highest bidder? Vornado are like that. Except they haven’t sold out. Their unique fans work by spiralling the air, letting it ‘bounce’ off a wall or ceiling. 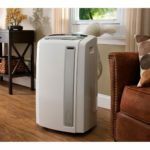 This spreads the air around – giving a nice breeze throughout your living space. 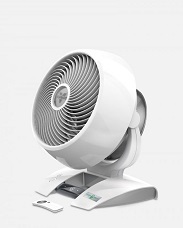 With a Vornado fan, there’s no need to just get a small gust of air every few seconds. Instead, enjoy a constant cooling comfort. Check out this 1 minute video to see how the air circulation works. The idea belongs to the late Ralph K. Odor and Ottis A. Sutton. Originally aeronautics engineers, they first coined the fan type back in the 1940’s – while designing a new airplane. Later, with the help of a friend, they transferred that same idea to home-fans. 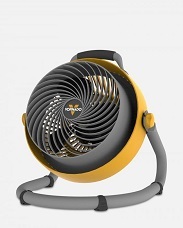 Yes – these fans are based on an airplane design! The best part is, it isn’t just this unique type of fan that’s worth paying for. 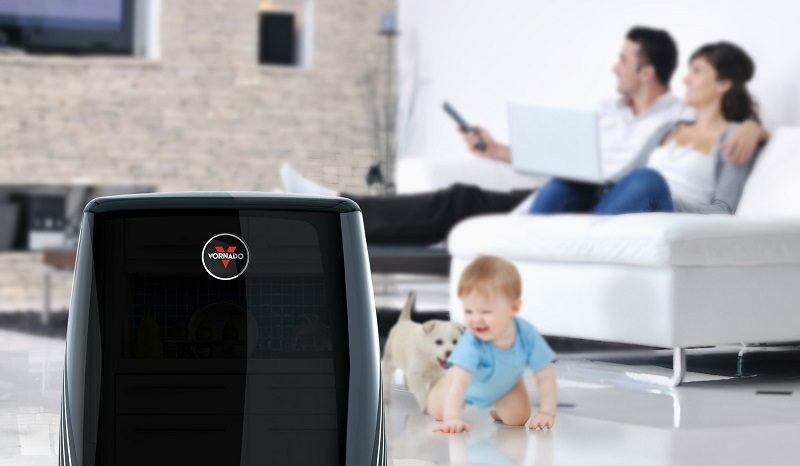 From the very beginning, Vornado have always been huge on providing top market quality to their customers. MASSIVE warranties of up to 10 years, excellent customer support, and a product which (typically) uses less power. Even if these were only normal fans, they’d still be one of the best on the market. Vornado’s newest air circulator fan models. These fans embody Vornado’s signature technology. They harness the air circulation spiral method – just place them on a raised surface or floor; angled towards a wall. You’ll be enjoying whole-room cooling in seconds. The fans vary in size, power, and speed settings – which you can compare by using the tables below. This first table is Vornado’s newest fan range. With options for small, medium, and large fan sizes. Click on any of the product names to see their latest price on Amazon.com. Vornado’s main air circulator fan style. Next up are their slightly older fan models. I say slightly, because there is no drop in quality. It’s more of an appearance update. 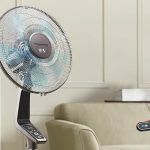 With more size options, including compact and standing models, these fans are how Vornado really made a name for themselves. Vornado’s newest energy saving fans. The newest models on the markets are these Energy-Savers. These really are the ultimate in modern home fans. Providing energy savings of up to 80%, while also upping the power, these models are an upgrade in every sense of the word. They also have 99-speed settings, with a touch-sensitive remote which is very easy to use. Top this all off with Vornado’s MASSIVE 10 year warranty, and you’ve got a truly unbeatable product. Seriously. We’ve found nothing that even comes close to these warranties. These next models are the older energy saving versions. These fans include the same energy-smart improvements we spoke about above. It’s important to stress that ‘older’ really doesn’t mean a drop in quality. They just have a bit less functionality, and a lower price tag. These fans switch out the remote and electronic controls for a variable dial, but still boast the same energy saving potential and huge 10 year warranties. 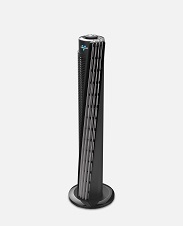 Vornado’s tower fans act similar to their standard air circulators. They don’t ‘spiral’ the air – instead focusing on providing a strong and wide current to encourage the airflow rebound to cool down the whole room. With tall and slender designs, these sleek fans will fit perfectly in any modern space. We recommend choosing a tower fan if you’ve got a good location with lots of available wall space for good air rebounding. Check out the quick video below to see how these tower fans work. 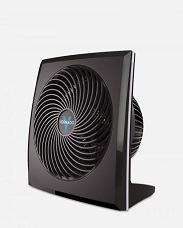 These next fans are newer models, with an incredible modern design. Coming in at a larger size with more power and speed settings, these are great if you have a larger space. However, there is a price increase. The quality on both new and old is still outstanding. 5 year warranties come standard on both models, so focus on the fan that suits your space and room size. These new models also have energy saving upgrade options, indicated by the ‘E.S.’ in the table below. These advanced models also offer up to 80% savings on running costs, with more power and incredibly accurate controls. Topped off with Vornado’s unbeatable 10-year warranties. Thin but powerful panel fans. While these panel fans are thin, they still hold all the capability of Vornado’s air circulation technology. Easy to strategically locate around a room, these panel fans are great for discreetly providing air circulation throughout a whole room. They’re also great to stack a few together, if that suits your space. They’re perfect for garages and workshops, or anywhere that needs cool airflow in a specific location. These panels come in three sizes, listed in the table below. 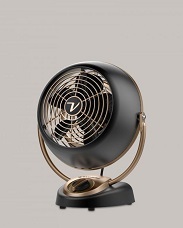 These vintage fans pay homage to the original Vornado fans, dating all the way back to 1945. Available in green, white, chrome or ‘alchemy’ as pictured, these classic designs are fantastically authentic. These fans doesn’t come with a sacrifice in power. With excellent build quality, including an all-metal exterior, they stay true to Vornado’s quality standards. Incredible for products that look like they’re a century old. You do sacrifice on ease of use in terms of electronic controls, but this is matched by the amazing looks of a fan which is guaranteed to be a great talking point. 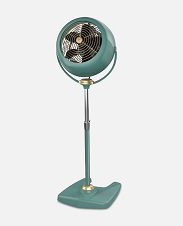 The vintage fans are available in all sizes, from miniature to large standing-pedestal fans. 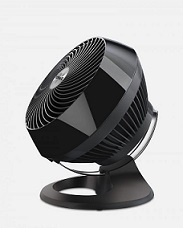 These Flippi’s, as they are so lovingly named, are Vornado’s take on compact/personal fans. Top quality compact personal fans – ‘Flippi’. They’re too small to use the air circulation technique of the bigger fans. However, they stay true to Vornado’s high quality standards. Small enough to sit happily next to you on a desk, they oscillate like traditional fans, or operate in a fixed position. Several size options are available, ranging all the way up to the ‘V’ model – which comes with it’s own remote control and LED speed indicators. 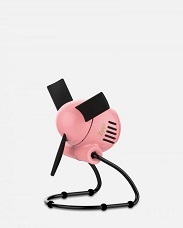 Pivot – a small desk fan, with a much more contemporary design. A uniquely pivoting axis with several color options, it fitss in perfectly with any modern desk space. 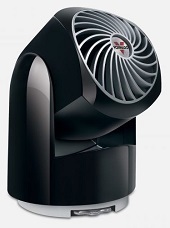 Zippi – the smallest fan made by Vornado. It (somehow) gives out a surprising amount of air flow, and it’s battery powered, so it’s effortless to take with you. It’s got super soft blades which won’t catch on your fingers, and folds down for simple packing. V103 – this fan is similar to a panel fan, but it can also fold away. You can store these models anywhere, and pop them out when you need them. Perfect for tight spaces, especially in a boat cabin or small garage/workshop. They also fully rotate! 293 Heavy Duty – don’t let the name scare you. This isn’t a jet plane engine. This model is roughly equivalent to the fans at the very top of our list, but it’s built to be used in the roughest of environments. Featuring a dust-protected ball-bearing motor which doesn’t need oiled, and an extra-long power cord, this fan is perfect if you’ll be doing heavy work in a garage or workshop. 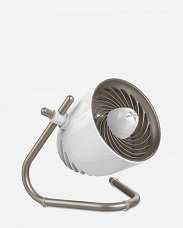 Since their inception, Vornado have remained at the forefront of indoor fan technology. 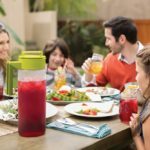 Their success is based on a recipe of unique technology, stellar product quality, and outstanding customer service. We hope that this guide has given a clear overview of their product catalogue – a resource we hope is useful when deciding over quality products like these. If you’re going to be buying a fan with a 10 year warranty, it’s hard to be certain which one to choose! If we’ve missed any points or you need any clarifications – please leave us a comment below. Thanks for reading.